Click me for the story! Hey guys! This is just another thread created for the purpose of discussing the story at your leisure. I wanted to create a separate thread for this because this board will just serve as commentaries and opinions about the story, rather than requiring you to review or critique something about it. Overall random things you've read that you simply want me to see as an author, questions about points that may be confusing, or just simple talk about what you read and what you enjoy/don't enjoy are all welcome here in this board! Only rules I ask for are simple courtesy towards others when discussing things in this board and simple respect for my time. As well as limiting what you would like to see in the story to "suggestions". Which, to put bluntly, means don't just blatantly command me to write a shipping or a situation into this fic because you want to see it. I welcome ideas and overall different approaches to heroes, villains, relationships, etc. and have taken some ideas thrown at me before in the story, but I will not tolerate those who aggressively demand me to make changes without proper courtesy or criticism. Quote: In a certain sense, they are the same person. That is to say, very long ago, before Planet Vegeta was the Saiyans’ planet, there was a man named Yamoshi who had a righteous heart despite being a Saiyan. He and his five comrades started a rebellion, but he was cornered by combatants and became a Super Saiyan for the first time, though his transformation and fearsome fighting style shocked the other Saiyans. Outnumbered, Yamoshi eventually wore himself out and was defeated, but this was only the beginning of his legend. Afterwards, Yamoshi’s spirit wandered in continuous search of six righteous-hearted Saiyans, seeking a new savior: Super Saiyan God. It's nothing bad or anything. It reminds me of Dragon Ball: New Age, where the artist kept putting all the new content of Dragon Ball in the fan comic that it just becomes distracting. Best leave it alone for a while (or just don't use it at all) until you figure out to fit it in. -There is a little more being set up here too. Bardock’s introduction, IE, should create a loose end in terms of logical occurrence that will be a plot point much later on for a later story (depending on how much effort i can devote to this series, I want to have this be a leading plot detail that will come into play for the biggest villain in the series). So somethings that may seem confusing now, I might already have a plan for. But by all means, I am not perfect and I hope there are more issues you can poke out that I have not covered. This, however, is mostly thought out. So with that being said, I think this topic is better explored a bit later so then you can pick out the execution of those small details. Finished the completed FF in about 4 days. I think. Your talent in writing RP fight scenes certainly lends itself here to an impressive degree. I don’t have much to say, I struggle to articulate praise in a way I find useful. Suffice to say I’ll use a glow word: Amazing. Though, one thing sorta remains. In 50 chapters and countless words, you blew through half a dozen power ups, though granted that’s par for the course of Dragon Ball all considered. Super Saiyan Blue 2, Rose 2, Blue 3, Sword of Hope Trunks (without bringing in the actual sword of hope unless I missed something), Saiyan God Kavassa, Goddess of Time Kavassa, True Super Saiyan God Kass, Ultra Instincf Vegetto AND Gogeta. It’s sorta leaving me with the same feeling I had before in Dragon Ball. The characters who propel themselves forward, Vegetto and Kass, and to a lesser extent Trunks and Gogeta, have reached such a level that they left the previous realm of strength they had existed in. Now granted, you already set up a way to avoid the problem, but I hope that the (canon) third entry into Time Patroller Vegetto’s story maintains the same tension, rather than suffer the problems associated with power inflation, a lack of believable stakes and reptitiveness. But, I have faith in you. P.S. Still waiting for Vegetto and Raptus to fight, Super Spirit Sword VS Dread Spirit Sword. (11-21-2018, 09:11 PM)Grey Star Wrote: Finished the completed FF in about 4 days. I think. Your talent in writing RP fight scenes certainly lends itself here to an impressive degree. Appreciate the kind words man, thank you very much! The propelling of the main cast, however, is something that I personally designed a bit as the big issue for Vegetto and Trunks at the start of this entire story was in Vegetto's problematic need for someone to mirror his own needs as a fighter and to have that clearly solved by the end of the story. Now granted, that could've been done easily with Gogeta as a side character, but the experiment of taking a character from a standpoint of nothing (Kass) and having them work to the level she obtained was also a key desire of mine to see if it can be done in a manner that naturally wouldn't trigger certain fanboys (I'm looking at you, Caulifla and Kefla ;P). Which, side note, I absolutely love Caulifla and Kale's implementation into the story and really don't see the reason for the hate on them. Yet, I took the flames that came from their impact on the show and used it to further enhance my goal of turning a brand new character that has literally nothing special about them power wise (no Broly "i have immense power from birth because of a legend" esque stuff) and actually bump them up to the highest echelon of power without triggering fanboys. That, of course, then allows Vegetto to develop alongside her even though, ironically, his advancement into the levels of Blue came from losing the fight against SSJ with Kaioken. Where one of the main ideas of Dragon Ball is that through constant struggle, you become better and better. So the goal is then, on paper, accomplished in scaling things in a believable manner. Which is my big concern: making transformations impactful and special went out the window a bit once we got the scaling that happened in between Zamasu and ToP arc. Of course, I did try to make certain ones special and nostalgic like SSB 3, but I can settle for the notion that I failed horribly on that and diminished the story content a bit in that rise to the top. Now, depending on how crazy Super scales after what was the ToP, things should mostly calm down a bit to where we don't have to blast through so many transformations just to get a realm of power established. But I can't say for certain as I do not control the canon work and part of my fun in FF writing is to try and create a story that could theoretically still fit into the lore of the original works. (11-22-2018, 01:14 PM)Vegetto Wrote: Appreciate the kind words man, thank you very much! I wish I could say more without it sounding like me trying to jack you off or such. Yes, that's a joke. Quote: So the goal is then, on paper, accomplished in scaling things in a believable manner. Which is my big concern: making transformations impactful and special went out the window a bit once we got the scaling that happened in between Zamasu and ToP arc. Of course, I did try to make certain ones special and nostalgic like SSB 3, but I can settle for the notion that I failed horribly on that and diminished the story content a bit in that rise to the top. Blue 2 and 3, Rose 2, Fused Zamasu, SSG Kavassa, Sword of Hope Trunks, and Ultra Instinct Omen (that's what the DB Wikia calls it don't sue me) all were very impactful in their moments of the story, that you succeeded well on. Even if Blue 2, Rose 2, and Blue 3 were maybe 5 chapters apart of introducing them, each time they were revealed it was incredible. The parts that really got me was Kavassa getting both True God and God of Time status in two chapters of each other, it strained suspension of disbelief a bit. Now, with the way the story was set up it was completely necessary and they, after the introduction, went on to become incredible fight scenes. The part that truly got me was the whole "where do you go with Kavassa as both a True Saiyan God AND God of Time, and Vegetto as both a Blue 3 AND Ultra Instinct with Gogeta who also has Ultra Instinct." But, you answered that thing well on Discord. The sequel, if it ever gets written, is on a level more on par with the Destroyer Gods and an upper limit of the Grand Priests himself, bar Zeno. Even with two Blue 3s with Ultra Instinct at that level, there's still plenty of room there for new challenges in a way it remains believable. 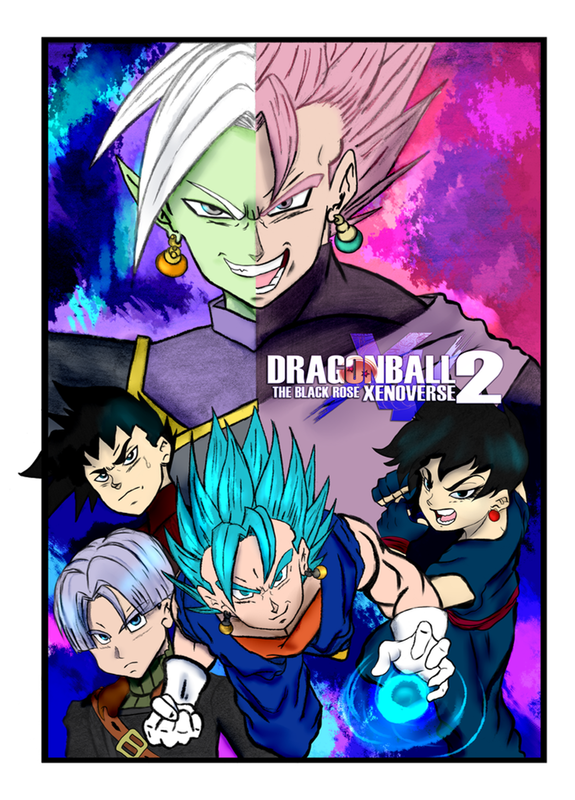 After all, 12 universes, all with a Destroyer God, has to be more fighters where that came from if Universe 7 had two potential replacements for Beerus hanging around. Just to be clear, everytime I bring it up I'm mostly doing it for the meme. Now that I have had a lot of time to reflect on this piece of work, I personally had just a random idea strike me today out of the blue. Normally, I have a good bit of moments hit me while I'm listening to music and driving in my car, today being no exception. One thing, after looking back on this story, that I honestly have a hard time supporting is just how serious in tone Genn's character is, impact wise. I originally intended him to be as such: in fact, he was supposed to be the most serious character introduced into the story in order to create a secret moral that I sought to establish using a villain like Zamasu. However, to me, it feels a bit over the top and outlandish: he is definitely not a character that I could whole heartedly say belongs in a work of fiction like Dragon Ball. -Kassava is the main heroine that is obsessed with doing good and is a fangirl of Vegetto, while Genn is the begrudging "ex-con" that is forced into the life of a hero due to having only one person left in his life that he cherishes. Instead of this reverse complex of Genn being a former criminal that reveres Vegetto as a hero to use as a role model, I believe the story might have had a better, more interesting dynamic between the characters had Genn's personality been less of a serious and "goody goody two shoes", and more of a clearly disreputable individual struggling to adapt to doing the right thing. His presence within the cast would then create an awkward, yet interesting dynamic in how Kassava would force Vegetto and the Time Patrol to put up with him, as well as forcing Genn to put up with the Time Patrol. His intelligence as a fighter could then be exemplified, creating more reason for his presence in story events with him being more of an intellectual yet weaker fighter while Kassava is the power house, but very inexperienced warrior that learns from him until meeting Vegetto. This, in turn, would create a smoother transition into connecting Kassava and Vegetto, given she has more reason to interact with Vegetto in motivation despite her extreme desperation for reliable and sane individuals in her life. The dynamic between Vegetto and Genn, due to this growing relationship, would then be more entertaining and easier to bridge characters together through other, more comedic reasons that are similar to Dragon Ball's methods of creating friendships through unlikely but funny means (IE, Genn forming friendship with Trunks in comedically paying him to keep eyes on Vegetto and Kassava, or something). The big goal, however, is still in the aspect of Genn's character being the epitome of everything Zamasu fights for: an evil mortal, that because of his nature, is incapable of doing good in the eyes of the god. Genn's character, being more like a typical antihero and being more selfish, would normally try to avoid Zamasu. This would ultimately lead up to him attempting to flee from the situation, but upon realizing he is the only one capable of stopping Zamasu when all others are preoccupied in the Battle for Conton City, he would finally come to understand those values that Kassava attempts to teach him throughout the entire backstory and FF itself. Dying a heroic death and forcing Zamasu to fuse into an imperfect body would then be more impactful and potentially less predictable: the buildup would be more in Genn finally becoming a hero than to atone for his past sins like the original story. With that being said, the secret moral of the story was in the notion that even the worst criminal can still stand up for what is right. As a means to connect to a certain audience, I decided that perhaps if I had written Genn this way, he may have been more relatable as a character for someone that is a former criminal, now trying to live and be a valuable member to society. Of course, the mission was never truly to realize that, but it was an idea that I felt would be good if it came to pass through the methods of my story.